There are no major economic reports to be published in Japan but the US will release TIC Long-Term Purchases, Crude Oil Inventories, NAHB Housing Market Index, Business Inventories m/m, Industrial Production m/m, Capacity Utilization Rate, Prelim Unit Labor Costs q/q, Prelim Nonfarm Productivity q/q, Empire State Manufacturing Index, Retail Sales m/m and Core Retail Sales m/m. 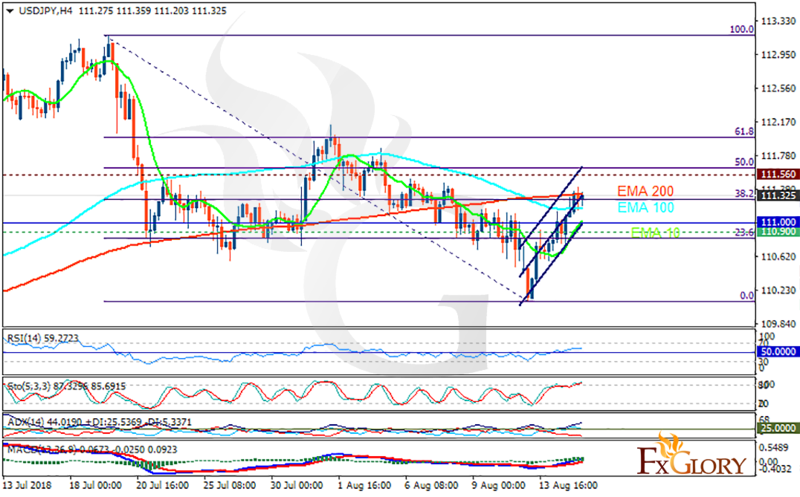 The support rests at 110.900 with resistance at 111.560 which the weekly pivot point at 111 is located in between the lines. The EMA of 10 is moving with bullish bias in the ascendant channel and it is below the EMA of 200 and the EMA of 100. The RSI is moving above the 50 level, the Stochastic is moving in high ranges and the MACD line is above the signal line in the positive territory. The ADX is showing strong buy signal. Long positions are recommended towards 61.8 level of Fibonacci at 112.